Massachusetts Pedestrian Injuries – How Safe is Your Street? Federal lawmakers have introduced the Safe Streets Act of 2014 into the United States Senate. The goal is to reduce the number of pedestrian accident fatalities occurring across the country. Pedestrian deaths have become a serious problem. From 2009 to 2012, there was an average 4.9 percent increase in pedestrian motor-vehicle deaths each year. The result is that deaths went up around 15 percent even as the overall number of traffic fatalities in other categories declined by three percent. The Safe Streets Act could improve conditions and bring this death toll down, but unfortunately it is unlikely to make any kind of real difference. Massachusetts is widely known for its university campuses. For decades, campuses have been swarming with pedestrians, cyclists, and cars full of students coming to and from class. Combine this busy all-day traffic with distracted drivers, pedestrians with headphones, cellphones and general distractions and you have a scene ripe for accidents. Tufts University departments are teaming up to launch an extensive campaign to improve safety for pedestrians. After a string of accidents and hundreds of on-campus accidents nationwide, other universities should consider following the lead. Pedestrian safety on-campus can prevent accidents and injuries. Our Massachusetts pedestrian accident attorneys are dedicated to helping victims and their families recover compensation and move forward after an accident. We are also dedicated to safety and awareness campaigns that aim to prevent future accidents and injuries. In-line with the goals of Tufts, we believe that implementing regulations and raising awareness is critical in reducing the overall number of campus pedestrian accidents. Nationwide, there has been an increasing number of pedestrian and cyclist accidents on public and private university campuses. This could be partly related to a spike in matriculation; however, it could also be related to driver and pedestrian distraction. Universities and other public health agencies are urging students, teachers and staff to remain aware of the dangers of busy, high-traffic campus intersections and to take precaution while on campus. One driver is in some serious trouble, and facing some serious charges, after allegedly killing a man at a bus stop in Cape Cod. According to CBS Boston, it happened along Route 28 when the driver was reportedly attempting to escape officers. As he drove off erratically, officers backed off. Eventually, his tire blew and the man pulled into a nearby parking lot, where he is accused of slamming into a man waiting for the bus. The pedestrian was killed almost immediately. The defendant has been charged with failing to stop for police officers along with other various motor-vehicle violations and is being held without bail. Our Boston pedestrian accident lawyers understand that pedestrians are oftentimes threatened by the dangerous and irresponsible driving habits of others. Unfortunately, we can’t rely on their driving habits to keep us safe out there. That’s why it’s of utmost importance that we’re always aware while traveling on foot and we remain one step ahead of the traffic around us. Our lives depend on it. 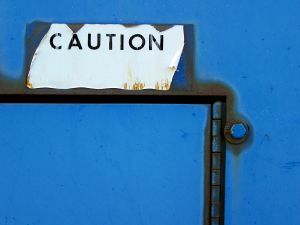 According to the National Highway Traffic Safety Administration (NHTSA), there were close to 100 pedestrians killed in the state of Massachusetts in 2010. These fatalities accounted for nearly 20 percent of all of the traffic fatalities recorded throughout the entire year. The problem is that much of Massachusetts relies on walking to get to where they’ve got to be. We’re blessed with short commuting distances, but we’re plagued with irresponsible drivers. While walking throughout the state, we’re asking you to be especially caution while moving at night. This is when a majority (close to 70 percent) of pedestrian accidents occur. If you’re older, we’re asking you to be careful, too. According to the NHTSA, older pedestrians (age 65+) accounted for close to 20 percent of all pedestrian fatalities and an estimated 11 percent of all pedestrians injured in 2010. Would you believe that there are 2 million? That’s what the Boston Public Health Commission says. And according to the official census, about 600,000 people call Boston home. That means the rest are likely unfamiliar visitors and workers. With that many people walking in our city, pedestrian safety is an issue of critical importance. 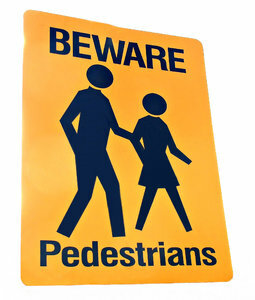 As pedestrians, we can help to reduce our risks for these accidents by following the road laws and keeping a heads up. -Only about 10 percent of pedestrians wait for the “WALK” signal before attempting to cross the road. -About a third of all pedestrians jaywalk. 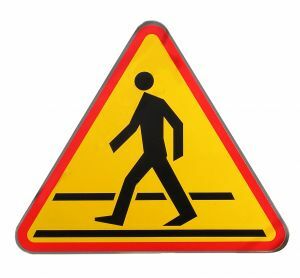 -Close to all drivers yield to pedestrians when the walkers have the right-of-way. Only about 50 percent yield when the driver has the right-of-way. It’s getting warm out there, and the sunny weather is providing the perfect conditions to get outside, enjoy the scenery and get some exercise, all while saving on fuel consumption. But you don’t want to run the risks of getting into a potentially fatal accident with a motor vehicle. Stay alert and stay alive. On November 21, 2012, a 21-year-old Tufts student was hit by an SUV when crossing at the intersection of Powderhouse Boulevard and Packard Avenue. The student was critically injured, prompting Tufts to launch an investigation into the safety of the intersection. Our Boston pedestrian accident attorneys applaud the efforts of Tufts University in taking action to work to make the intersection safer. The accident serves as an important reminder that a poorly designed or poorly lit intersection can be extremely dangerous and illustrates the potential harm that can result from bad road design. The investigation launched by Tufts University will involve a review of the area where the accident occurred. A consultant has been hired to study the crossing and to provide advice on what modifications can be put into place to improve safety. The recommendations will then be reviewed and hopefully implemented to make the intersection safer. According to Boston.com, some steps have already been taken to reduce the risk to pedestrians. For example, new signs and new lights have already been added. Further steps as recommended by the transportation engineer reviewing the intersection should hopefully help to avoid any future accidents. Tufts has also contracted with the transportation engineering company to begin a review of all of the roadways on the school’s campus once the review of the dangerous intersection has been completed. By studying all of the intersections and providing advice on how to make them safer, the transportation engineering company can hopefully help to prevent more students and visitors from losing their lives. What Happens When a Pedestrian Accident is Caused by a Dangerous Roadway? Pedestrian accidents caused by dangerous roadways can be devastating, especially when the pedestrian suffers critical injuries or is killed. The injured pedestrian or surviving family members of a pedestrian who is killed may be left with significant financial losses as a result of medical costs and lost earning potential. The victim or surviving family members also suffer intangible losses such as pain and suffering, emotional distress and loss of companionship. If the accident was truly caused by a dangerous intersection, other avenues of recovery may be available in addition to holding the at-fault driver accountable. 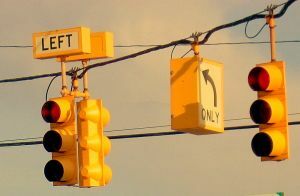 In certain cases, the person or entity who was responsible for the design of the dangerous intersection can be held accountable. However, there are limitations on when this is possible. If the entity responsible for designing and maintaining the roadways was a government agency or a government employer, then governmental immunity may apply. This doesn’t mean it is impossible for an accident victim to file a lawsuit to recover damages as a result of an accident caused by a poorly designed intersection — but it does make it more difficult for the injured person to take legal action and win. Local officials are looking to better pedestrian safety at the Bianculli Boulevard/Morrissey Boulevard intersection. This recent safety effort comes after a local resident, Savin Hill, posted a video about the ongoing dangers that pedestrians face at this intersection. Passing traffic is not only threatening to pedestrians, but it’s threatening to all travelers of the area. According to the Boston Globe, reps from the Department of Conservation and Recreation, elected area officials and state police visited the area, which is a gateway onto the University of Massachusetts Boston campus. This area was recent dubbed a “human frogger” game by one local blogger. Our Boston personal injury lawyers understand that there were close to 250 pedestrians in the state of Massachusetts who sustained severe or incapacitating injuries in motor vehicle crashes in 2008. It’s important that our city is equipped with the devices that are needed to help to keep our walkers safe, especially because pedestrian traffic is so prominent in the area. According to the Boston Public Health Commission, about 10 percent of pedestrians actually wait for the “Walk” signal before crossing the street. About a third of all pedestrians jaywalk. What’s even worse is that only about 95 percent of drivers yield to pedestrians. Many of these dangers can be reduced, if not eliminated, if our roadways were more equipped for this kind of traffic. At a recent meeting regarding the dangerous intersection at Morrissey Boulvard and Bianculli Boulevard was the City Councilor Frank Baker, state Senator Jack Hart and state Representative Marty Walsh. And they promised action. Officials with the Department of Conservation and Recreation say that they’re going to be making some short-term improvements to the area and to the pedestrian traffic signals at that intersection to help to make sure that vehicular traffic will stop when pedestrians need to cross. Hart says the he hopes that the action of local officials will help to alleviate the concerns regarding pedestrian safety in the area. 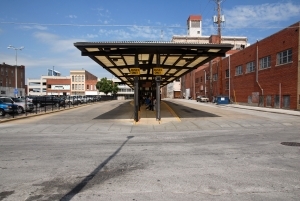 Officials are also hoping to create and implement a long-term solution in the area soon. A completely new design for the intersection may be soon in the works. Officials have already scheduled a follow-up meeting with officials of UMass Boston, the Department of Conservation and Recreation and Massachusetts State Police. According to the official census, about 600,000 people call the City of Boston home. When you add the workers and the visitors who come to the city each and every day, there is an estimated 2 million pedestrians. This is another reason why pedestrian safety is, and should be, an issue of critical importance. Drivers are asked to be cautious throughout the entire area to help to protect our most vulnerable travelers. Officials are investigating an accident that has claimed the life of a 38-year-old man. According to NECN, a young bicyclist was also seriously injured in the accident. She was taken to the hospital for treatment. The incident occurred about 2:00 p.m. on Temple Street in Whitman. According to officers, the little girl and her mom’s boyfriend were trying to cross the street, but weren’t doing so in a crosswalk. The driver involved in the accident was driving a pickup truck. He said that he tried to stop and then tried to help the victims. The Whitman Fire chief also tried to help. The accident happened right outside of his house. The young bicyclist was transported to Massachusetts General Hospital. The truck involved in the accident had firefighter plates, but authorities don’t think he’s a firefighter. They did however, confiscate his cell phone as a part of the investigation. It has not been determined whether he will face charges. “We don’t know why they might have been in the street or any other contributing factors of the nature of the crash,” said Tim Hanlon, Deputy Chief. Our Whitman pedestrian accident lawyers understand the risks that our residents face when walking neighborhoods. Even in residential areas, motorists show little concern for pedestrians. They forget that these individuals have rights on the road, too! Unfortunately, about 20 percent of all traffic accident fatalities in the state of Massachusetts in 2008 involved pedestrians. During that same year, there were nearly 250 pedestrians who were seriously injured in these kinds of accidents too, according to the Massachusetts Department of Public Safety. The likelihood of hitting a child pedestrian is higher when the motorist is returning home from work. Most child pedestrian injuries occur between 3:00 and 5:00 p.m. For K-3 most injuries occur by running into the street mid-block, while older children are most often injured at intersections. The truth of the matter is that many of these accidents happen outside of a crosswalk. Pedestrians are urged to not only cross at street corners, but also in crosswalks whenever possible. Officials with WalkBoston are working diligently to help to make the area safer for all pedestrians and travelers. One of the keys to making this happen is to design streets so that they’re safer. Officials with the group work to help local officials design and construct communities so that they’re more walkable. 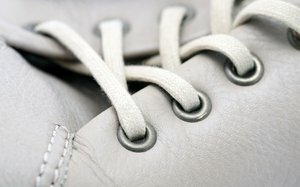 -Advise on walking improvements for the community. -Provide guidance, moral support, technical assistance. 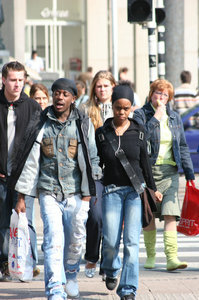 -Conduct a number of presentations on pedestrians advocacy and design. -Demonstrate how these techniques are working across Massachusetts and elsewhere. One of the main points officials with WalkBoston push for pedestrian safety is to get transportation officials to slow down their speed limits. As the speed of a motor vehicle increases, so does the risk for serious injury and death for a pedestrian in the event of an accident. Pedestrian fatalities are a real risk throughout New England, but nowhere are walkers at greater risk than the City of Boston. Traffic is getting crazy out there and drivers don’t care if you’re in another car, if you’re on a motorcycle or if you’re on your own two feet. Drivers aren’t paying attention to what’s going on around them or even to road laws. That’s one of the main reasons why the number of pedestrian fatalities has increased significantly in recent years, despite the overall decrease in the number of traffic fatalities. There were nearly 33,000 people who were killed in traffic accidents in the U.S. in 2010, according to the most recent statistics from the National Highway Traffic Safety Administration (NHTSA). More than 4,250, or close to 15 percent, of these fatalities were of pedestrians. That means that a pedestrian was killed in a traffic accident every two hours and another one was injured every eight minutes. 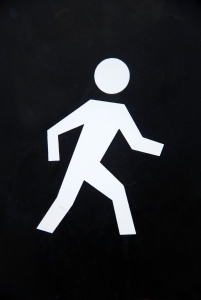 Our Boston accident lawyers understand how popular walking is in the state of Massachusetts, especially within Boston. At least once a day, everyone is a pedestrian. We rely on buses, trains, cabs and subways to help us to our destinations, but ultimately we rely on our own two feet to get us to where we need to go. In 2010, there were nearly 100 pedestrians killed in traffic accidents in Boston. Every year, there are more than 1,150 pedestrians taken to the hospital after an accident with a motor vehicle. While we may not have made it on the list of one of the most dangerous states in the nation, we definitely didn’t make it on the list as one of the safest. About 90 percent of the pedestrian accidents recorded in 2010 happened when the weather was just fine, meaning there was no bad weather to blame. Some may have blamed the light, or lack thereof, as about two-thirds of pedestrian fatalities happened at night, according to The Washington Post. Alcohol is nothing to brag about. In fact, intoxicated drivers were a factor in close to 15 percent of pedestrian fatalities and intoxicated pedestrians were involved in close to 35 percent of pedestrian deaths. 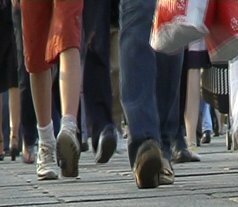 The Boston Public Health Commission (BPHC) is asking pedestrians to pay more attention to their surroundings when walking along our streets. According to a recent study, little more than 10 percent of pedestrians wait for the “Walk” signal before they attempt to cross the street. About a third of all observed pedestrians jaywalk, meaning they cross at least 5 feet from a crosswalk. About 95 percent of drivers yield to pedestrians when pedestrians have the right of way, only about 50 percent of drivers yielded to pedestrians who were crossing against the light. Even fewer drivers slowed down for jaywalkers. A recent accident, on Sumner Avenue near Lester Street, took the life of a mother and seriously injured her nearly 2-year-old daughter. The mother and her stroller were hit by a passing motorist. The child was ejected from the baby stroller and flew onto the side of the road. The child was last reported to still be in the pediatric intensive care unit at Baystate Medical Center. She is suffering from an abrasion to her liver, a collapsed lung and a few broken ribs. She needed nearly 30 staples to close up a cut in her head, too. To make matters even worse, the driver who hit the mother and the daughter didn’t even stay at the scene to offer help, instead he drove off after the collision. Luckily, officers have the driver. He turned himself in to the headquarters. He is awaiting his arraignment and is facing charges of driving a motor vehicle with a revoked license, using a motor vehicle without authority, leaving the scene of a personal injury crash that resulted in a fatality, leaving the scene of a personal injury accident, negligent operation of a motor vehicle and motor vehicle homicide. “It was an accident, but it stopped being an accident as soon as he left,” said the mother and grandmother of the victim’s. Our Boston pedestrian accident lawyers understand how dangerous our roadways can be, especially if you’re traveling on foot. Every year, there are hundreds of pedestrians who die in vehicle-related accidents. Both drivers and pedestrians need to be aware of their surroundings at all times to help to reduce the risks of these accidents. This is especially important when one of these pedestrians is a parent, traveling with a young child. The mother and the daughter were heading home from the mall at roughly 8:00 p.m. when the accident happened. The bus stop where the two got off is right in the middle of the two closest crosswalks. Heading to these crosswalks means tacking on another half mile to their journey. Residents say that the absence of crosswalks and the heavy, speeding traffic produces a deadly combo. Pedestrians are asked to keep a lookout for dangerous drivers at all times. This is especially important when you’re walking with a young child. 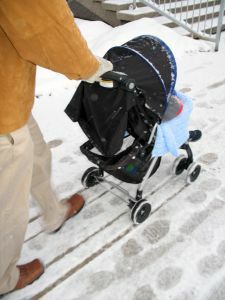 When you’re walking with a stroller, you want to make sure that you have ample time to get across the roadway. Rushing with a stroller is not only dangerous in terms of a vehicle-related accident, but it also poses injury risks to your child. You want to avoid walking at night, especially with small children. If you have to walk when it’s starting to get dark out, make sure that your wear bright-colored clothing and reflective materials to help passing motorists to see you more easily. NeighborWalk Logs More Time for Healthy Residents! We have a lot of pedestrians throughout the state of Massachusetts. Many residents choose to walk to both work and school as well as to public transportation spots to get to where they’ve got to go. There are also a number of NeighborWalk community walking groups. Recently, Mayor Thomas M. Menino teamed up with these NeighborWalk community groups at the local Franklin Park Zoo to show his support for the success of this program. This initiative provides people who live in the area with an opportunity to get out there and to get active, according to the City of Boston. Unfortunately, we’ve got some high accident rates involving pedestrians in the area, too. Not only are these kinds of events held to help to get residents healthier, but they’re also used to raise awareness about our pedestrian travelers throughout the state. All too often, walkers are overlooked by motorists. Residents, visitors and other travelers need to be more cautious of one another as we work to help keep our city safe for everyone. Our Boston pedestrian accident lawyers understand that this is the 10th year that the NeighborWalk program has been going on. It’s all a part of Boston Moves for Health. To help to celebrate this milestone in the program, the senior vice president and the executive director of the Boston Red Sox Foundation made an announcement that he would be donating $10,000 to the program to not only show his support for it and for healthy residents, but to also help to fund some of its events through the fall season. “These walking groups really embody the spirit of Boston Moves for Health,” Mayor Menino said. Menino adds that he would like to continue to urge everyone in the area to grab their friends and their family members to get active and to get moving. Our city offers some great parks for getting out there and getting active. Menino says that this program helps to get Boston to be a healthier city. NeighborWalk helps to provide funds for not-for-profit, community-based organizations that work to encourage residents to get out there and get walking. Many of these organizations help to provide accessible routes for pedestrians and lead walks every week during the summer season. This year, there were nearly 30 walk groups within the Boston area that were able to round up nearly 400 participants. Boston Moves for Health has been able to log more than 7,000 miles just this spring. -Poor muscle and joint health. After a recent pedestrian accident in Brockton, a high school student was left with a bleeding liver and a plethora of other serious injuries. After much worry and many procedures, he’s looking like he’s going to make it. The accident happened when the 16-year-student from Brockton High was crossing the street right in front of his school and was hit by an unlicensed driver. According to local police officers, the student was in the crosswalk when the accident happened. According to Police Lt. Paul Bonanca, the unlicensed driver of the van involved in the accident was cited by local officers for driving without a license, but no other charges regarding the accident have been revealed. By the time the victim’s father got to the hospital, doctors had already cut him open. He was split from his chest to his waist as surgeons prepared to staunch the bleeding that could have killed him, according to Enterprise News. His liver was bleeding and doctors had to get it under control if they had any hopes on saving his life. Our Boston pedestrian accident lawyers understand that these kinds of accidents, involving motor vehicles and pedestrians, happen all the time, especially in busy Massachusetts’ towns like Stockton and Boston. Pedestrians throughout the state are being struck by drivers who fail to acknowledge their presence. The father of this Brockton High student now knows that reality all too well. “The doctor told me, ‘I can’t give you any guarantees until the (bleeding) stops, and we won’t know that until tomorrow,'” said the dad. That night lasted forever, recalled the father. Days later, the father got some good news. With odds against him, his son was moved from the intensive care unit and was moved over to a regular hospital room. Although he’s in a regular hospital room now, his body is far from normal. In the accident, he was thrown about 30 feet and the impact ended up injuring his liver (causing internal bleeding), bruising his lungs and breaking his upper arm. Because of his internal bleeding, medical professionals with the Boston Medical Center’s intensive care unit had to slice him open from his neck to his waist. They’ve left the incision open so that they could go back in 24 hours and check on the bleeding again. Thankfully, the bleeding was under control when doctors rechecked. Now, the student has to meet with a physical therapist each and every morning to regain full control of his body. Unbelievably, he’s able to walk but has much difficulty completely ordinary, everyday tasks. He remains in the hospital. Doctors don’t know when he will be able to return home as that relies on a full recovery which is a long way off.